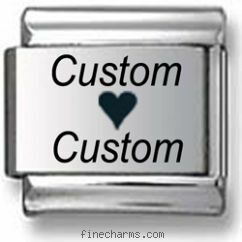 Custom Loves Custom Laser Charm. Zoppini heart starter bracelet. Remember when you were a little kid and you used to carve you and your sweetie's name into a tree with a heart in between both names? Now we adopted that nostalgia and created a custom laser charm out of it! This special phrase is laser engraved into a stainless steel charm so the memories will last forever.